This is a tough one. The logo is great but is in desperate need of a modern overhaul. A one color image with a newly designed font and re-jigged branding would be a start. 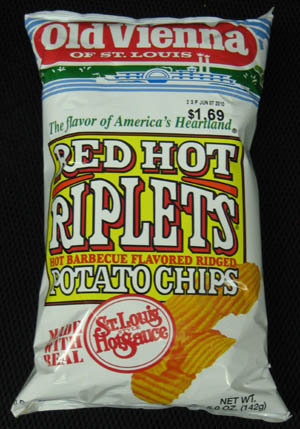 Old Vienna are the only company that calls their Ridged Chips 'Riplets' so they should make more of it, while making the bag explain what Riplets are. The bag is all just a big bunch of writing, with nothing to invite a potential consumer to open it to see what is inside. As a sort of contradiction to the Texture section of this review, these were rather sturdy in design. Although lacking thickness, they were bold and rigid, perhaps this is why there were a lot of broken Chips. The crunch followed as well. It was almost a brittle, snap crunch. Chips took a lot longer to melt in mouths than many regularly cooked Chips. These Chips are evenly Marcelled with a lot of broken Chips and broken edges. When you Ridge Cut a Chip it is much easier to maintain whole product if the Chips are thicker. There was some browning in areas, but not much visible oil. There was a kind of oily sheen in parts but no bubbles. The dark read seasoning was spread unevenly which gave the impression of honest hand seasoning. Heat in food is a subjective issue. Neither does the tolerance level relate to enjoyment - there are lots of people that have no problem eating fiery food, but can't tell you whether they enjoyed the flavor. So, with a Hot Chip, and this does claim to be a hot sauce Chip, we believe a good guide to rating is flavor must be apparent, along with heat. So, these were hot Chips. They were quite salty, not very sticky sweet, but there was a barbecue sweetness to them. And most importantly, the especially overly seasoned Chips evoked images of Johnny Cash singing his finest song!